Yesterday was the first day of school for the 2016-2017 school year. For those of you keeping score at home, I now have a 9th grader, a 7th grader and a 2nd grader. That's one on each campus in our district. I dropped Sam and B off at football practice and morning program, respectively, yesterday morning and walked into the middle school alone. Zac works out on Monday mornings so Ryan brought him later. It was odd to walk into my school alone. I only saw Zac by accident in the late afternoon. I had to talk to his English/Language Arts teacher and got to catch a glimpse of him in class. Emotionally, it was a strange day for me. I wondered what B and Zac were doing through out the day but I wasn't worried about them. I was worried about Sam the most. High School can be a scary place. I wondered if he was able to get to all his classes. The HS is on a block schedule so I prayed that he went to the right classes. 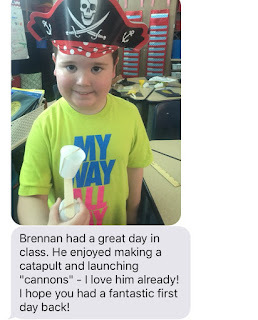 Towards the end of my day, I received this awesome text from B's teacher. It was such a relief. I knew he was happy if he was able to make something. I didn't realize how much I missed him until I got her text. I was anxious to hear how the day went. I have to say, the afternoon/evening was the strangest part of the day. B & I came home together. Then Ryan came home. Then Zac came home from middle school football practice. Then Ryan left to go coach 2nd grade football (the team that B's supposed to be on but he's not...). Finally, Sam got home from high school football practice. We were not all home together until 8:30 when Ryan got back from football practice. And even then, Zac was asleep. The evenings will be the biggest adjustment for me this year, I think. Dinner will be more grab and go. I'm going to have to work hard to keep making dinner. Sometimes I don't cook if it's just B and I. We eat PB & J. But that's not ok for Ryan and the Bigs. I'm going to have to get used to them eating at different times. And alone. How was your first day back? What adjustments will you need to make this year?